In the aftermath of VW's diesel-cheating scandal, Mueller sought to overhaul the automaker's rigid top-down management structure, delegating more responsibility to its brand and regional chiefs. Volkswagen Group CEO Matthias Mueller has won wide praise for steering the automaker through the near-death experience of cheating on diesel-emissions testing -- but that wasn’t enough to keep him in the job. On Friday, VW’s supervisory board will vote on sweeping changes that will include replacing Mueller with Herbert Diess, the head of VW’s namesake brand, according to people familiar with the matter, who asked not to be identified speaking ahead of an official announcement. The 64-year-old Mueller, who took over in 2015 and has worked inside the Volkswagen structure his entire adult life, has two years left on his current contract. At the close of trading Tuesday, the company’s shares were up 4.5 percent. 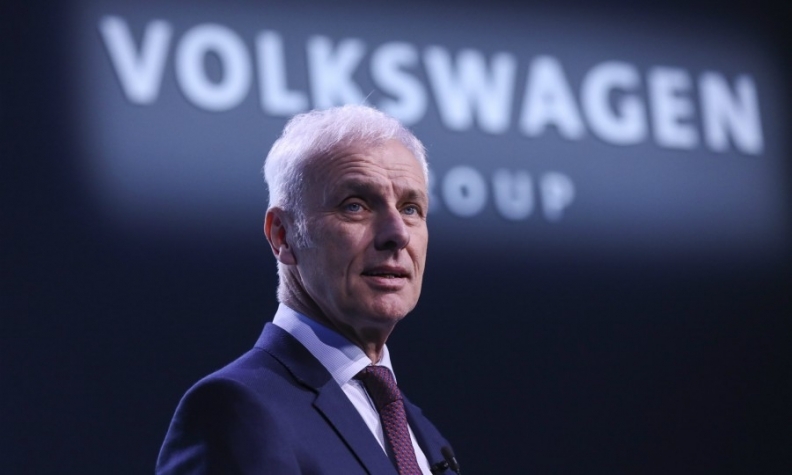 The news poses more questions than it answers, as VW gave no details beyond a cryptic regulatory filing earlier Tuesday that it was considering a change in the CEO job. The statement, peppered with conjunctives, didn’t specify whether that meant replacing Mueller or simply a shift in responsibilities. VW officials had no statement beyond the two-paragraph filing. In tapping the 59-year-old Diess for the top job, Volkswagen would elevate a senior executive from its own ranks, while handing the reins to someone who was not at the automaker when the diesel cheating began. Diess joined VW from German rival BMW in mid-2015, shortly before the scandal erupted publicly. As the executive overseeing VW’s biggest unit, he has routinely butted heads with powerful labor leaders as he has sought to cut costs and simplify the automaker’s byzantine structure. The announcement caught investors off guard and left analysts scratching their heads regarding the timing of the shift. It comes just a few weeks after Mueller presided over improved earnings, with operating profit excluding special items last year rising to 17 billion euros ($21 billion). “I don’t see an obvious trigger that would have prompted this,” said Christian Ludwig, an analyst at Bankhaus Lampe. Under Mueller -- who was promoted to the top job in the chaotic days following the public disclosure of the diesel cheating -- VW has weathered the blows from the scandal while embarking on an aggressive expansion into electric cars. Its profit margin climbed to 7.4 percent of sales last year from 6 percent in 2015, when the crisis hit. The company also managed to fend off Toyota Motor to retain its status as the world’s largest automaker. In the aftermath of the diesel-cheating scandal, Mueller sought to overhaul Volkswagen’s rigid top-down management structure, delegating more responsibility to its brand and regional chiefs. The complexity extends to its main shareholder, Porsche Automobil Holding SE, where Poetsch serves as the CEO and Mueller as a top executive. Porsche said in a separate release that any changes at VW would be reflected in its management. Including Mueller, VW’s management board totals nine people, with responsibilities ranging from purchasing to legal affairs to financing and human resources. Audi, the VW brand, the trucks division, and the group’s Chinese operations also have representatives on Volkswagen’s top executive body. Publicly listed companies in Germany have two management structures: one consisting of the management board around the CEO and a supervisory board that is made up half-half of labor representatives and members of the capital side to ensure even distribution of interests. Volkswagen is more complex than most of its peers, with the Porsche-Piech families de-facto controlling the manufacturer and the state of Lower-Saxony -- home to the company’s headquarters and VW’s main factory -- owning 20 percent. While Mueller is a lifelong VW veteran, at times he cut an uneasy figure in the top job, which required him to manage the often contradictory demands of angry car owners, disgruntled investors, well organized workers, and state officials with their own political agendas. Tensions flared in recent weeks between Mueller and Lower Saxony’s leadership, which is represented on the supervisory board. Mueller told German magazine Der Spiegel in March that he “doesn’t like politicians meddling with my business,” likening a discussion about a salary cap for executives to the oppressive system of the former German Democratic Republic. Mueller’s total compensation was more than 10 million euros last year. Mueller’s comments exhibited “a lack of sensitivity at a difficult time for VW,” Lower Saxony’s economic minister Bernd Althusmann, who also sits on VW’s supervisory board, told German daily Hannoversche Allgemeine Zeitung. The news, along with the announcement Sunday that Deutsche Bank had tapped Christian Sewing to succeed John Cryan, helped spark a modest rally in Germany’s benchmark DAX index, which was up 1.1 percent for the day.